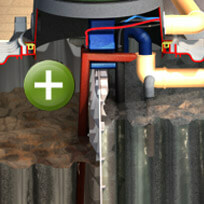 How does a small wastewater treatment system work? 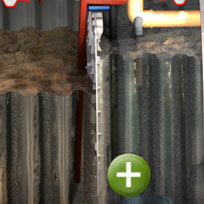 Clear water extraction channels the cleaned wastewater into a flowing watercourse or infiltration system. 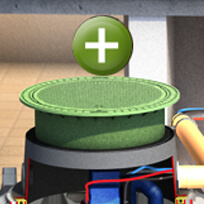 The wastewater treatment technology handles all transport and treatment processes inside the treatment tank and cleans the wastewater by up to 99%. The system control for the small wastewater treatment system is installed in the house or in an optional external control cabinet. This controls all transport processes within the system and monitors the treatment process. 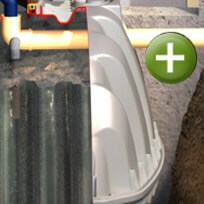 The tank cover seals the SBR wastewater treatment system at the top edge of the ground. 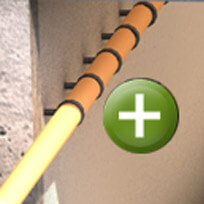 For optimum adjustment to local circumstances, its height can be continually adjusted and it can be tilted. It is sealed to the top edge of the ground. Depending on where it is installed, the cover may be suitable for pedestrian, vehicle or HGV loading. The dividing wall separates the treatment tank into the pre-treatment section (1st chamber) and the SBR basin (2nd chamber). 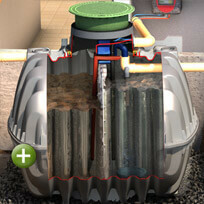 The Carat RS underground tank with dividing wall forms the heart of the SBR small wastewater treatment system.